Australia has a large and diverse community that offers much choice when it comes to synagogues and Jewish education. From Orthodox to Reform and most things in between; there is something for everyone. With a significant proportion of Holocaust survivors and their progeny, a very strong Chabad presence which spurred significant growth in the 1960s and following, and as yet relatively low rates of intermarriage (compared to the US), Orthodox Judaism remains the most dominant flavour here among the institutions. But interestingly, some of the largest and oldest Orthodox shuls have a significant proportion of members that are not practicing Orthodox, but they remain members of the shul, and only attend a few times per year. I’ve called them ‘Orthodox Affiliated‘. A good way to understand this category of people is through the perceptual map below, which plots a variety of Jewish flavours on a scale which measures ‘Level of Engagement’ on the vertical, against ‘Connection with Tradition’ on the horizontal. Apologies in advance for the crudeness of this classification, which is bound to offend someone. However, the underlying principle is that with increasing connection to tradition, comes increasing level of engagement with Jewishness. One can’t be Haredi without being extremely engaged with Jewishness – going to shul three times a day, dressing and eating in a particular manner etc. On the other end of the scale, being a Reform Jew has a far lesser requirement for engagement. When we place the diversity of Jewish groups on the map (recognizing that the ranges overlap), they form a rough line that illustrates this important correlation. 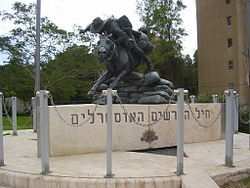 Importantly, the Gen08 Australian Jewish Population Study also noted in its report on Jewish continuity that there is correlation between level of engagement with Jewishness particularly measured by the number of Jewish ‘touch-points’, and the ability to successfully transmit Judaism to the next generation. 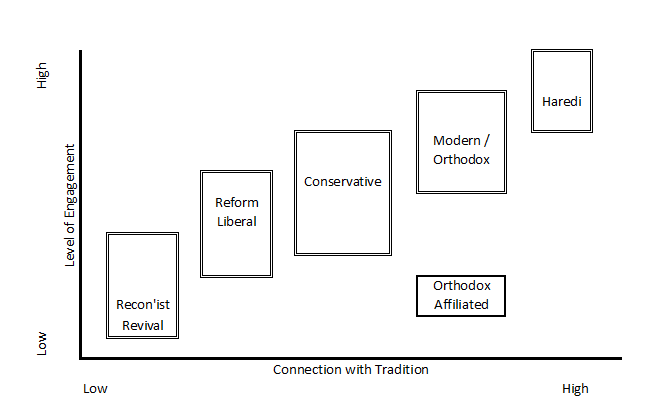 When we consider ‘Orthodox Affiliated’ using this framework, it’s clear that they are something of an outlier compared with the others. This is because they have a low level of engagement to a Jewish group that has a relatively high connection with tradition. How does someone become ‘Orthodox Affiliated’? Most commonly, this happens because one’s parents or grandparents were Orthodox, and therefore were members of an Orthodox synagogue. But while the level of engagement with Jewishness dropped off with successive generations, the association with Orthodoxy remained. This could be out of respect for past generations, or perhaps a desire to remain connected to a brand of Judaism they considered more ‘authentic’, despite the choice to no longer be observant. This is more common in here than in the US, because a much larger proportion of non-Observant Jews had Observant grandparents or great-grandparents. Another way to become ‘Orthodox Affiliated’ might be through Chabad, which attracts the unaffiliated, but makes few demands for observance. The more important question is: what is the path beyond being ‘Orthodox Affiliated’? The low level of engagement with Judaism means the ability to transmit Jewishness is weak. It’s quite possible that the children of ‘Orthodox Affiliated’ parents are more likely to drop-off completely than move across the perceptual map to a flavour of Judaism that better matched their desired level of engagement. This is particularly the case as they get one generation further from ancestors who were Orthodox. It’s worth noting that Chabad’s engagement model may reduce the risk of drop-offs, and even leave open the possibility of increased engagement in the next generation, which is clearly the long-term (unstated) goal. Clearly there are serious Jewish continuity risks associated with being ‘Orthodox Affiliated’. It raises a question which would certainly be hotly contested: is it better to be an engaged Reform Jew or a disengaged Orthodox Affiliated? This is adapted from an article first published on Times of Israel. Next Why is Bob Carr itching for a Fight on the Arab/Muslim/Left Cold War Against Israel? All very important, very valid points. Obviously the scope of such topics is infinitely vast. Opinions are bound to fly from and to al directions. Mine would like to refer simply to the notion that one of the most relevant factors in maintaining at least, and hopefully developing genuine involvement in Judaism, and I purposely avoid here the term “Jewish involvement “, is the acceptance that only serious, systematic study of Judaism would engage the individual on a path of informed, most beneficial existential direction. Mechanical, socially affable participation, reflex participation to rituals is likely to diminish commitment and give way to more “attractive” alternatives, with the generic Jewish or even totally outside our traditions, culture, reflexes etc. Just look at the “philosophically” inclined activists in all sorts of “just” causes. I had to rush somewhere and could not finish my last idea. Once nominal Jews enter the intellectually “entertaining” world of the “free spirit” all kind of finger lickin’ stylistic and ideatic goodie are on offer. A world of infinite inspiration and varied sources is at their finger tips. Great minds surround them making for a most exciting, obligation free existence. Great inspirational personalities abound offering limitless intellectual opportunities, causes worth drinking, smoking anything and even jumping from high altitudes into the abyss of total cerebral abandon……………………. I shall give here two cases, one of a “generic” Jew – actually born Christian and died Christian, but of Jewish heritage -, Karl Popper and Jan Komenski (Comenius) a valuable Moravian humanist with no Jewish heritage at all. Both hailed as great minds, yet both responsible for utterly ignorant statements about Judaism very similar with, inspired by traditional anti Semitic traditions. Yet, both regarded as important, comprehensive examples of valuable intellectuals, philosophers. Both, in fact, completely unaware of what Judaism means, what it contains if properly studied.